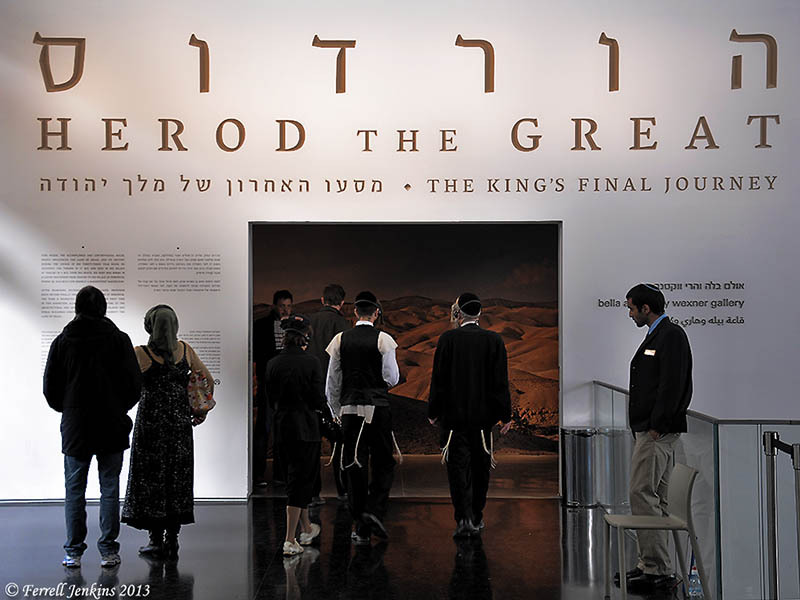 The Eretz Israel Museum, located on the campus of Tel Aviv University in Tel Aviv, is a wonderful, educational museum to visit. Many of the exhibits are outside, including an archaeological tel (Tel Qasile), and others are in several different small buildings. 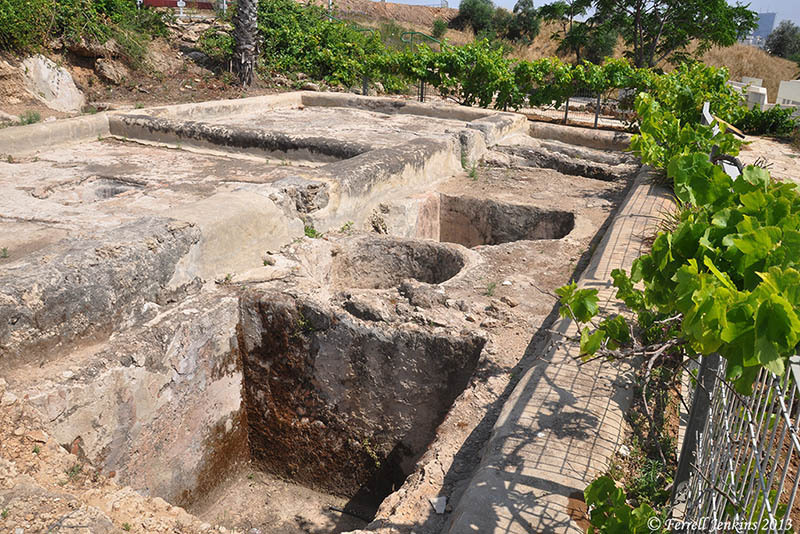 In the photo below we see two Roman period wine presses. (Common English versions use the spelling winepress.) The treading floors are on the left and the collecting vats are on the right. Roman wine presses at Eretz Israel Museum, Tel Aviv. Photo by Ferrell Jenkins. 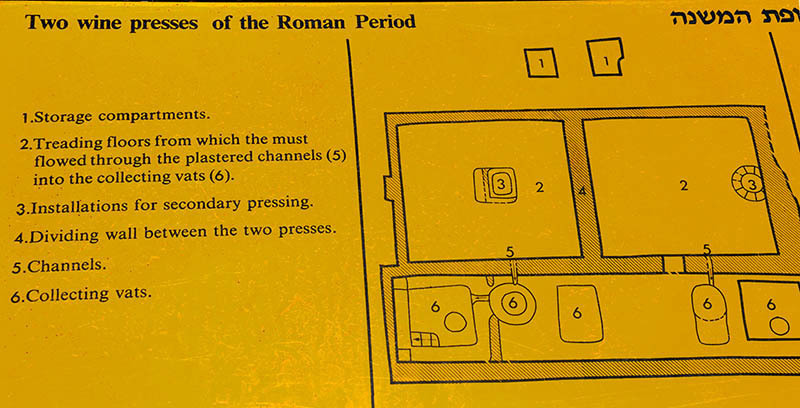 The sign below provides needed explanation for those who have not seen a wine press from the Roman period. Explanation of the Roman wine presses at Eretz Israel Museum. Photo: Ferrell Jenkins. One of the parables of Jesus illustrates how common such wine presses were in Biblical times. See a photo of the Byzantine wine press at Avdat here. The Museum website may be visited here. A town in the “valley” or Shephelah territory of Judah, named with Zanoah and Eshtaol (Josh. 15:34). Two places have been suggested as locations: one is Khirbet Umm Jina, very close to Beth-shemesh; the other is at Beit Jemâl about 3 km (2 mi) to the south. Beit Jamal is today the site of a small monastery nestled in an area of Olive groves. I came across it while looking for the road to Jarmuth (Hebrew, Yarmuth) (Joshua 10:3, 5, 23; 12:11; 15:35; Nehemiah 11:29). 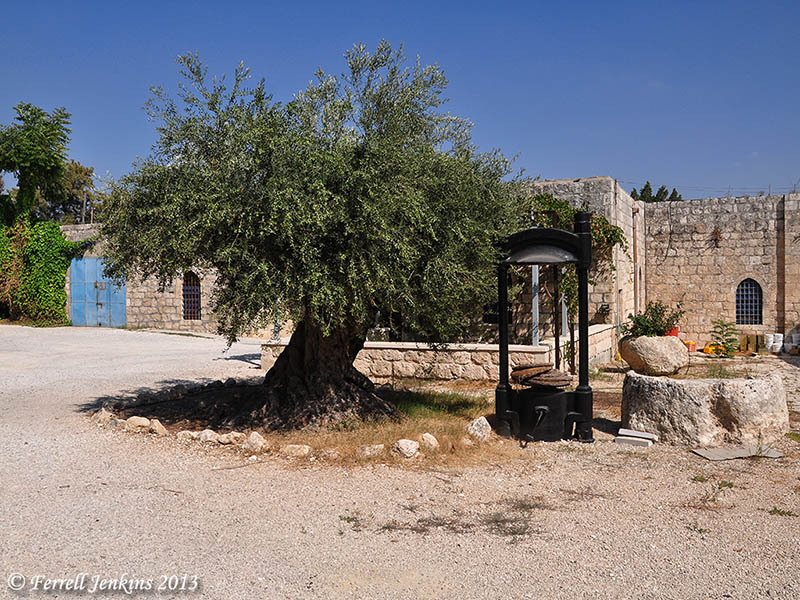 A large olive tree with two old olive presses at Beit Jamal. Photo by Ferrell Jenkins. Jewish extremists originally used the term “price tag” to describe vandalism and violence that targeted Israelis as well as Palestinians and was aimed at preventing or avenging evacuations of West Bank settlers. Here are some appropriate parting words for all of us. Live Science reports (here) on the investigation of 27 flasks from five archaeological sites in Israel showing that cinnamon was stored in them. The flasks date back to about 1000 years B.C. Ten of the 27 flasks contain “cinnamaldehyde, the compound that gives cinnamon its flavor, indicating that the spice was stored in these flasks.” Tel Dor is the only site named in the report. At this time cinnamon was found in the Far East with the closest places to Israel being southern India and Sri Lanka located at least 3,000 miles (nearly 5,000 kilometers) away. A form of it was also found in the interior of Africa, but does not match the material found in these flasks. This discovery “raises the intriguing possibility that long-range spice trade from the Far East westward may have taken place some 3,000 years ago,” researchers write in a paper to be published in the journal Mediterranean Archaeology and Archaeometry. Although cinnamon can be purchased today at any grocery or bulk food store, 3,000 years ago, people in the Levant would have needed to take part in trade that extended beyond the edge of the known world in order to acquire it, something this discovery suggests they were willing to do. This trade may go back ever further into antiquity and involve other goods and parts of the Middle East. The researchers note, for example, that black pepper from India has been found in the mummy of Ramesses II, a pharaoh of Egypt who lived more than 3,200 years ago. Cinnamon and pepper displayed on the ancient Spice Route at Avedat. Cinnamon is mentioned only four times in the Bible. 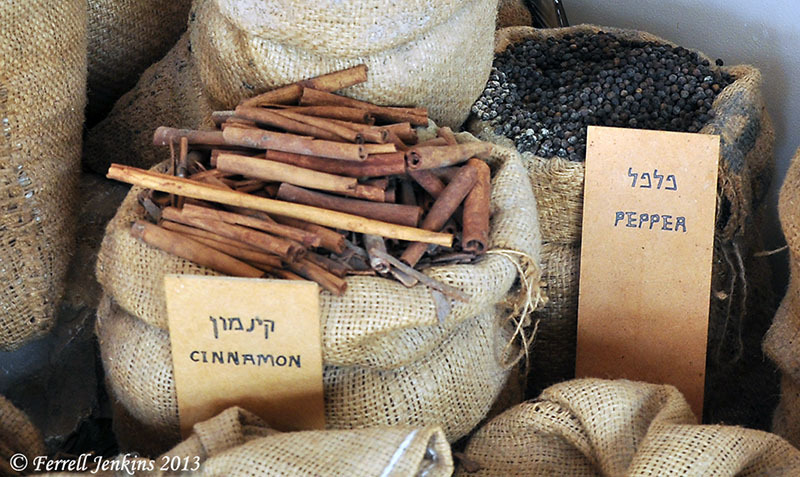 Cinnamon was used in the anointing oil for the tabernacle (Exodus 30:23). The adulterous woman tells the young man that she has perfumed her bed with cinnamon and other spices (Proverbs 7:17). Cinnamon is used in the sexual/sensuous context of Song of Solomon 4:14. Cinnamon is one of the spices imported by Babylon (the ancient Roman Empire) in Revelation 18:13. Much archaeological work goes on in the library and in the lab. Ashdod was located along an international highway known as the Way of the Sea, the Way of Philistia, or the Via Maris. This was the important route connecting Egypt and Assyria. We have already discussed, in the past few posts, that the Assyrian king Sargon II captured Ashdod in 712/11 B.C. The prophet Isaiah makes reference to this event in Isaiah 20:1. Sometime discoveries are made, but get little attention. A discovery at Tel Ashdod in 1963 falls into this category. Tel Ashdod was excavated from 1962 to 1972 under the direction of Moshe Dothan. David Noel Freedman wrote an article in Biblical Archaeologist (26:4, 1963)) about “The Second Season at Ancient Ashdod.” He describes the fragments of a stele of Sargon II. Fragments of another stele, commemorating the victories of Sargon, were found at Ashdod during the current season, thus offering direct confirmation and vivid illustration of the biblical and Assyrian accounts. In all, three pieces of the stele were discovered. Enough can be made of their contents to show that the inscription duplicated in content if not precisely in wording other victory steles of the Assyrian king. By comparing the Ashdod stele with the others it will be possible to reconstruct the missing parts, one of which described the actual conquest of Ashdod. The inscription was carved in cuneiform signs characteristic of Sargon and his period, on all four sides of a slab of basalt which had been imported from a region north of Megiddo. It may have served as a pedestal for an obelisk, or a statue of the emperor. It must have been erected between the year of victory at Ashdod and the death of the king in 705 B.C., perhaps in 707 when a similar stele was set up in Cyprus. With the accession of Sennacherib in 704, most of the vessel countries revolted; Hezekiah of Judah and Sidqa of Ashkelon were the ringleaders in the west. They were able to liberate Ashdod from Assyrian control, and doubtless the event was observed by the destruction of Sargon’s victory stele, symbol of foreign oppression. These fragments of a monumental Assyrian inscription are the first ever found in Palestine. The photos below were published in an article by Hayam Tadmor (“Philistia Under Assyrian Rule.” Biblical Archaeologist (29:3, 1966). Several years ago I used a digital camera to copy the photo. Sorry it is not better, but at least you can see the pieces. A photo of the piece in the middle below is also published in a BAR article (Jan-Feb, 2007) by H. Shanks on the “Assyrian Palace Discovered in Ashdod,” but the quality is about the same. Fragment of the Sargon II inscription found at Ashdod. For several years the fragments were displayed in a case across from the replica of the Siege of Lachish in the Israel Museum. For the past years the fragments have not been on display. I made inquiry at the Museum earlier this year without any success. I wonder if the pieces have been moved to the Corine Maman Museum of Philistine Culture in Ashdod. Can anyone help with this? This discovery is one of those that complement the biblical record. Sargon II (721–705 B.C.) is mentioned only once in the Bible — Isaiah 20:1. Isaiah says that the commanding general of Sargon II fought against Ashdod and captured it. 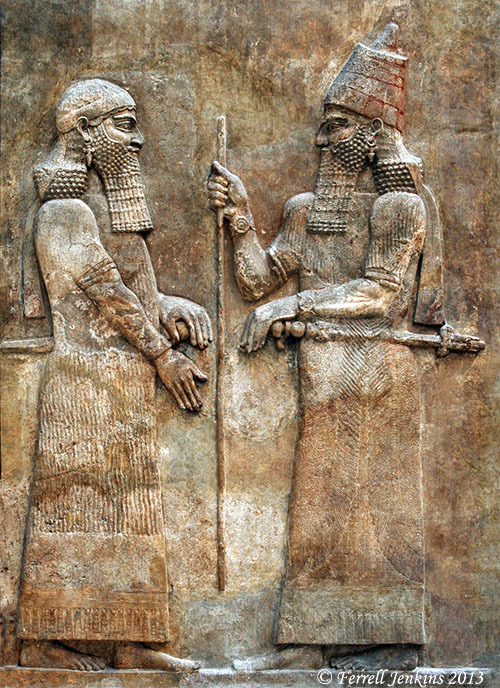 The photo below shows Sargon II (right) facing a person who is generally considered to be an Assyrian high dignitary. (See the discussion in Fant & Reddish, Lost Treasures of the Bible, 133-140. Sargon II and an official. Displayed in Louvre. Photo by Ferrell Jenkins. … for a long time this was the only place in extant literature where his name was known. The palace of Sargon II was discovered by Paul Emile Botta at Khorsabad in 1843. This relief comes from that palace, and is displayed in the Louvre. Other reliefs and artifacts from the palace are exhibited in the British Museum and the Oriental Institute of the University of Chicago. Written copies of Isaiah existed in what we know as the Dead Sea Scrolls nearly 2000 years before the discovery of Sargon’s palace and archive. Perhaps we should be slow to think of Isaiah and other biblical writers as being unhistorical. To say this in a positive way, this illustrates the historical trustworthiness of the Bible. That the only reference to Sargon is specifically linked to Ashdod is even more impressive. Ashdod is mentioned in the Bible as one of five cities of the Philistine Pentapolis (1 Samuel 6:17). The city is mentioned earlier among the Canaanite cities in the Ebla tablets. Here is a brief survey of the events recorded in the Bible. Some of the Anakim were left in Gaza, Gath, and Ashdod after Israel entered the land (Joshua 11:22). Ashdod was among some cities that remained under Philistine control even though it had been assigned to the tribe of Judah (Joshua 13:2-3; 15:46-47). 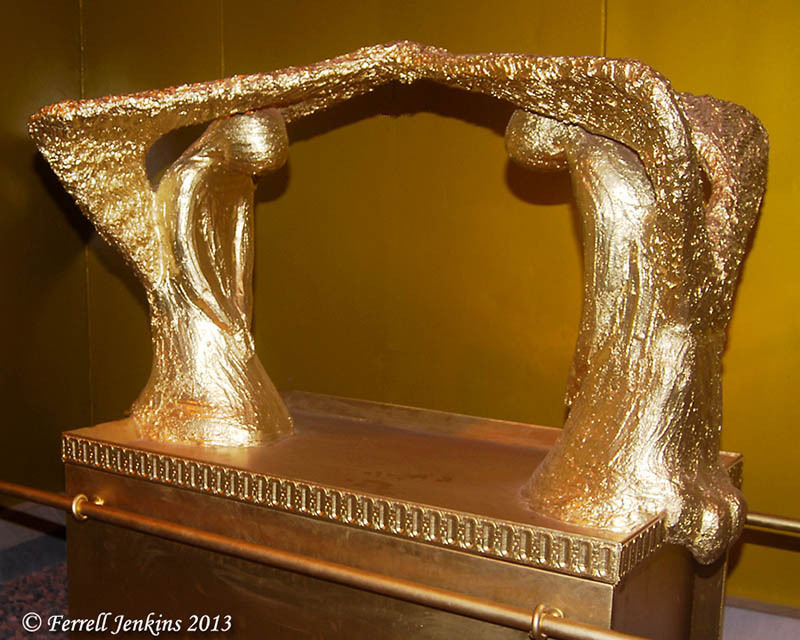 When Israel lost the Ark of the Covenant at Ebenezer, the Philistines brought it to Ashdod and placed it in the temple of Dagon (1 Samuel 5:1-8). Representation of the Ark of the Covenant in the Tabernacle in the Wilderness at Timna. Uzziah, king of Judah (767-740/39 B.C. ), made war against Ashdod. He broke down the wall of Ashdod and built cities in the area (2 Chronicles 26:6). King Sargon II of Assyria captured Ashdod in 712/711 B.C. (Isaiah 20:1). After the return from Babylon, Nehemiah faced problems because some of the Judeans had married women of Ashdod. Their children spoke the language of Ashdod, and could not speak the language of Judah (Nehemiah 13:23-24). The prophets Jeremiah, Amos, Zephaniah, and Zechariah spoke against Ashdod (Jeremiah 25:20; Amos 1:8; 3:9; Zephaniah 2:4; Zechariah 9:6). Ashdod was known as Azotus in New Testament times (Acts 8:40). In the next post we hope to discuss Isaiah 20:1 and the archaeological discovery that complements this text.